A knight was an armoured warrior who fought on horseback. Knights swore an oath of loyalty to a baron, promising to fight for him when needed. A boy who wanted to be a knight was taught to fight and behave properly from an early age. When he was older he became a squire. It was his job to serve a knight and follow him into battle. If he proved himself worthy of the honour, a nobleman would then ‘knight’ the young man. As part of the feudal system, he was usually given some land with peasants and villages to look after. This was called a manor. 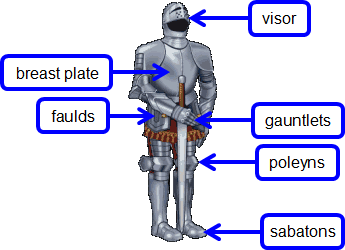 Medieval knights wore armour to protect their bodies. At first, most knights wore a coat of chainmail made of iron rings linked together in a mesh, which followed the movements of their body and stopped them getting hurt from sweeping sword strokes. As time went on, however, suits of armour made of overlapping sheets of steel became more popular as they: were lighter, were more effective at resisting arrows fired by longbows and they also looked nicer. Helmets were often modelled to the shape of a knight’s head and were fitted with a moveable visor that let them see clearly when fighting.